Announcing its sale of the South African asset, Highveld Steel & Vanadium, to Nemascore, a company created just weeks before, Evraz issued the following announcement: “EVRAZ announces intention to sell its South African steel mill. EVRAZ plc…announces the signing of a non-binding term sheet in respect of the proposed sale of its 85% stake in EVRAZ Highveld Steel and Vanadium Limited (“EVRAZ Highveld”) to Nemascore (Pty) Ltd, black economic empowerment consortium, for an indicative cash consideration of approximately US$320 million (the “Transaction”). 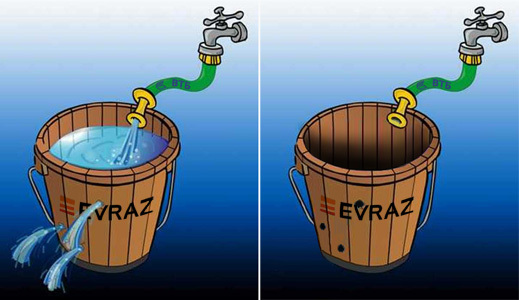 EVRAZ will utilise the sale proceeds for general corporate purposes.” That was on March 27. The shift from confident intention to conclude the sale to something that is no more than “potential”, and the continuing emphasis on the “non-binding” character of the papers signed so far, are fresh signs that support on the part of the South African government to provide the repayment guarantees required to underwrite financing for the deal is dwindling towards vanishing point. After Evraz Highveld released evidence of continuing falls in its production in the first quarter (compared to the same period of 2012), the share price on the Johannesburg Stock Exchange fell, and sector confidence in the pricing of the Russian government-financed deal began to evaporate. According to Highveld’s report, hot metal steel was down 11%, compared with the same period last year. Tonnes of steel produced fell 25%. Vanadium slag output fell 24%, while ferrovanadium, a key product of Highveld, dropped 30%. Evraz followed on April 18 with more details, indicating that despite the deterioration in year-on-year results, there has been a pickup in both production of steel and vanadium at Highveld in the first quarter of this year, compared to the final quarter of 2012. The share price is down 14% since Evraz announced its deal, and the market capitalization of the company is currently equivalent to $187.3 million. The Evraz offer price to sell its 85% stake for $320 million is more than double the value the market is putting on the asset. Nemascore’s directors, Linda Makatini and Pathmananthan Alwar, refuse to answer questions on how they came by the deal, and how Nemascore can afford it. The SA press has been hinting that the unfamiliarity of the Nemascore names, the transaction secrecy and the high price suggest the potential for corrupt involvement of high SA government officials. So what to make of the sale of Highveld to Nemascore? “It is a ring-fencing operation poorly executed. At this point of time, the rationale remains unclear. Incidentally, the artist of this kind of processes is the Brazilian investment bank BTG Pactual, the Goldman Sachs of the tropics, and a recent strategic partner with Russia’s VTB Capital.” VTB appears to be the financier of Nemascore’s capacity to offer $320 million for Highveld. VTB isn’t commenting, neither to deny its interest in the deal, nor confirm it.